Probably the best shot I’ve got of a long legged fly (Dolichodopidae). 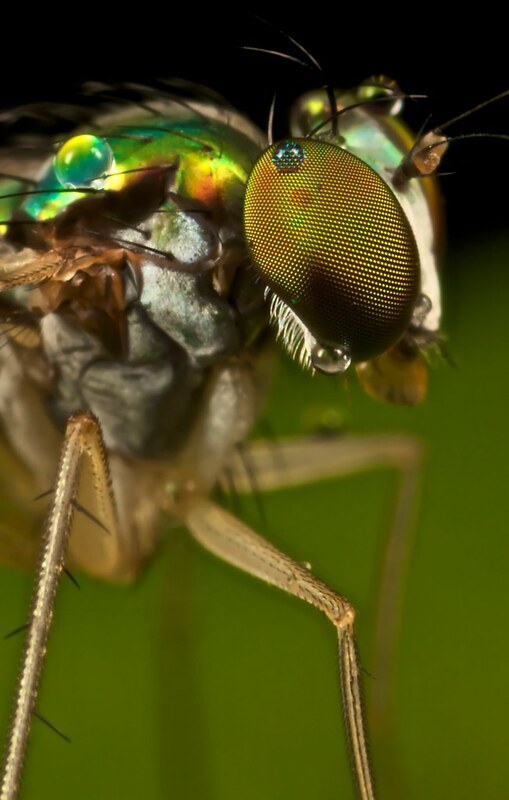 These brilliantly flashy flies have extremely fast reaction times. And generally between the time that the flash goes off and the shutter registers a shot on the sensor the fly will have taken off and all that one is left with is a picture of an empty leaf. That is why night is the best time to photograph these beautiful flies. One must still be careful and generally they permit only one shot with flash before they take off. Kurupukari crossing, Guyana. See tips and tricks on how I photograph these guys. Apart from getting lost from time to time, getting sick off stagnant water and finding a range of mind-bending insects, not much happened in the week that I spent at the Kurupukari crossing. 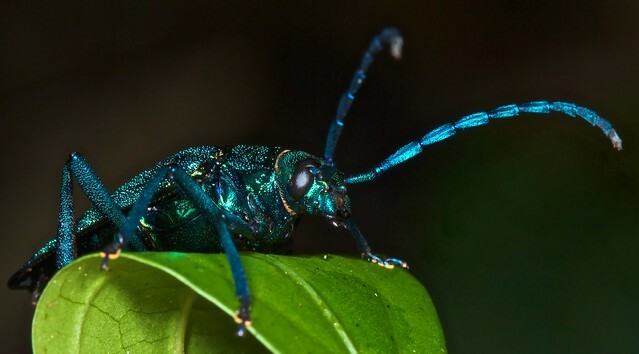 Iridescent blue longhorn beetle. Unfortunately I left my diffuser back at camp for this shiny guy. Kurupukari crossing, Guyana. 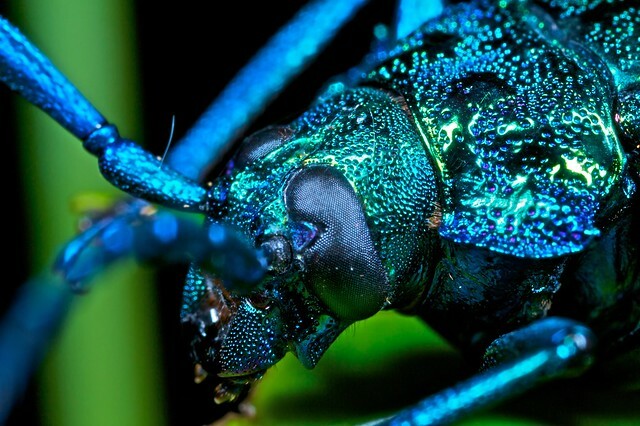 Iridescent blue longhorn beetle portrait. Kurupukari crossing, Guyana. Tarantula hawk (Pepsid sp.). 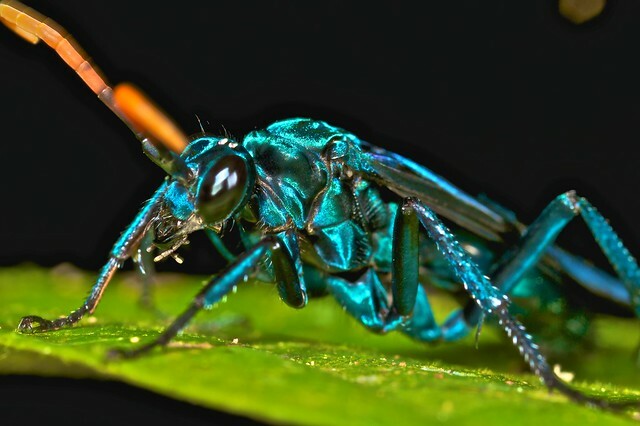 This wasp in addition to being beautiful packs a punch. The sting is one of the most painful amongst insects. And go figure they are attracted to lights. Fortunately they aren’t aggressive, but when you hold your flashlight in your mouth like I do while taking pictures, one must take care. After a few shots this wasp woke up and flew into my face several times. I didn’t really want to hang around, so I turned off my flashlight walked several paces away and continued my night walk with easier subjects. The tarantula hawk adopts a strategy similar to the digger wasp, whereby it paralyzes its prey with a sting and feeds the body to its young. Kurupukari crossing, Guyana. “No, no…”, he says wistfully. Then thoughtfully, “You want to stay up with me?”- point, point, point. “I can make tea and you”, point, “can make sure I…”, point, “don’t fall asleep”. “insects!”, slashing motion. “Stay with me”, feeling the sharpness of the blade with his thumb. 10 minutes later the guy is asleep, so much for conversation. Next day the guy did find me a rhinoceros beetle. Not completely making up for my lack of sleep but it was a start. It was a brilliant day of full sun, so I was able to do a rare daytime shoot and use colourful backgrounds to my advantage. Nevertheless I felt threatened enough not to fall asleep, so his goal was achieved whatever the intent. Next day I left for Iwokrama, no regrets there. It’s just a half hour walk down the road after I take the pontoon across. On the way I meet lots of nice people who offer me rides to the river lodge. I turn them all down because who knows which of them is a closeted freak who will chain me to the wall and force me to stay awake the nights making sure a generator won’t go out. That and the walk was pretty pleasant. Potato, potato right?